The app Figure 1 has been getting a lot of press recently. I learned about it a few weeks ago but I am just now getting around to mentioning it here. Figure 1 is being called the Instagram for doctors. It is a crowdsourced images database app. The crowd happens to be doctors, and the images happen to be medical images. The app is a collection of medical images submitted by doctors to share, collaborate and learn from. Doctors are verified using their institutional email address. The app takes patient privacy very seriously. It has a face detection program that automatically blocks out the face in a submitted photo and it includes other editing tools to remove other identifying features. A HIPPA authorization digital consent form is also included. Patients click the agree button then sign screen/form. David Ahn at iMedicalApps posted a great review describing the positives and negatives of this novel app. He notes some of the limitations of the app are the indexing of the images and lack of identifying information. Ahn discovered upon doing a search for heliotrope rash that the first seven results were “clearly not a heliotrope rash.” As librarians know, indexing images is tricky. Ahn noted Figure 1 also pulls images from outside medical websites (non-user submitted images) and a link to the website instead of the submitter’s name is listed. However the outside images have “no captions, markings, or even any clear diagnosis listed.” Besides the obvious problems with lack of identifying information, Figure 1 displays user submitted images before web scraped images. As Ahn illustrated with the heliotrope rash, this can cause problems because the correct image (scraped from the web) was buried below the 7 incorrect ones (user submitted ones). Additionally, I find doctors not only want to see and share images, but they often want to include them in presentations and slides for teaching purposes. Right now you can only share the images through the app. Emailing a colleague an image gives them a simple email (below) requiring them to use Figure 1 to see the image. Making it so Figure 1 images can be used in presentations would make this Instagram like app even more useful to doctors and medical professionals. This is a very new app. It appears they launched in May 2013, so it isn’t surprising that there is some room for improvement. I don’t know of any products or apps that are perfect 3 months from their launch. Yet as of today, it is the 5th most downloaded app in the Medical category of iTunes and according the MedicalApps post, the app is outpacing Landy’s projections. So, given its popularity I expect to see some improvements relatively soon. What I found to be interesting was Dr. Landy describing to Ahn his reason for creating this app. Dr. Landy wondered how he could quickly access a medical image database to assist in identifying new clinical pathologies. This question eventually led him to create Figure 1. Like many physicians, he was not satisfied with the paywalls of private medical image libraries or with Google Images’ lack of medical selectivity. Furthermore, when it came to sharing medical images with his peers, he found e-mail inefficient, as images would often get drowned out amidst ballooning inboxes. 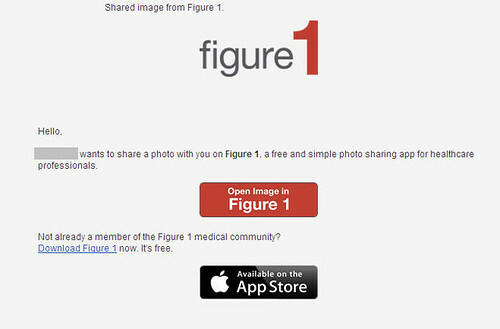 As a result, he helped create Figure 1, a free, crowdsourced medical image sharing resource that is quickly and easily accessible for health care practitioners. Finding good medical images has always been a booger, and Dr. Landy is right about the frustrations of pay walls. I would extend it a bit further to say that not only is the paywall part is a barrier to finding medical images, but the siloed nature of these medical image sites is a massive barrier as well. Even if somebody has paid for these medical image sites, there is no repository or online catalog of all the image packages bought from different companies. That makes searching for images difficult even if you paid for them. I am curious to see how Figure 1 evolves and what impact it will have on doctors finding images. I am also curious to see how/if subscription companies with medical image silos might adapt as a result of apps like Figure 1.